You are here: Home / News / Stephen Curry joins the fight for women’s equality. Stephen Curry joins the fight for women’s equality. Cleveland Cavaliers during the 2018 NBA Finals, he has kept himself pretty occupied. This summer, Curry has done exciting things like playing in a professional golf event, touring Asia to promote his signature shoe line, and playing soccer star Neymar in a basketball game of HORSE. Easily the best moment for Curry and his wife Ayesha had to be the birth of their son, Canon W. Jack Curry in July. It is the third child for Stephen Curry and Ayesha Curry as Canon joins his older sisters Riley and Ryan. Of course, many NBA fans are aware of the big personality of Riley Curry after she attended Stephen Curry’s press conferences a few years ago as he stayed focused but humored. As he has become a household name, Curry has also voiced the importance of empowering women and girls in America as well. 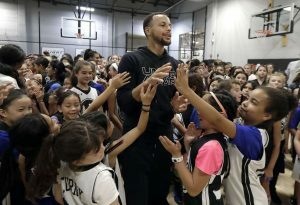 During August 2018, Stephen Curry hosted his first annual “It’s Our Game” basketball camp exclusively for girls. Summer basketball camps hosted by NBA players are very normal but they usually are numerically dominated by boys as it can be overwhelming and challenging for girls to feel welcome and open to attend. During this camp, Curry displayed basketball drills, gave some basketball tips and advice, and took pictures with campers. As important as the basketball development was that Curry had a question and answer session with several prominent women in sports and business. In late August, Stephen Curry penned an outstanding essay for “The Players’ Tribune” about his perspectives on women’s rights as his daughters grow older and show more interests and talents. He wrote, “I want our girls to grow up knowing that there are no boundaries that can be placed on their futures, period. I want them to grow up in a world where their gender does not feel like a rulebook for what they should think, or be, or do. And I want them to grow up believing that they can dream big, and strive for careers where they’ll be treated fairly. And of course: paid equally.” It is important for men to be advocates for women’s pay equity and Curry showed he was unafraid to do so while making his case in a logical and respectful way. During his essay, Stephen Curry also points out his son’s male privilege and mentions that he will emphasize to his son the importance of women and their equality as a human rights issue, not a political issue. He wrote, “ (to) teach him to always stay listening to women, to always stay believing in women, and — when it comes to anyone’s expectations for women — to always stay challenging the idea of what’s right. And I think you let him know that, for his generation, to be a true supporter of women’s equality — it’s not enough anymore to be learning about it.” It is a great message from a great athlete that women’s equality is a man’s problem and we must be active in solving it. He challenges men to support women and his vocal support against patriarchy needs to be the norm for men.